A Dublin Plasterer of 1838, William D'Arcy who was secretary of the Plasterers Society of 220 members, told a government inquiry his society was 175 or 167 years old, putting it in line with the foundation of the city guild of St Bartholomew of Plasterers and bricklayers. 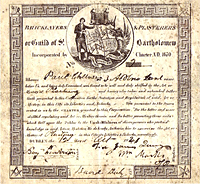 The Royal charter of 1670 granted to the combined craft of Plasterers and bricklayers by Charles II, gave legal authority to the working rules established between handicraft masters (employers), journeymen (day workers) and apprentices within the city of Dublin. The Guild was not a trade union in any sense but it could fix prices, wages and hours, regulate apprenticeships, provide charity and maintain the standards of arts and mysteries of the trade. The old guilds were dominated by the masters and members wielded political as well as commercial power, as freemen of the city giving them direct representation on the city council and the right to vote in parliamentary elections. They further reinforced the prevailing order through most of their existence by excluding anyone not a member of the established church of Ireland. Not all plasterers in Dublin were members of this guild. Even some of the foremost plaster craft workers of the city were outside the guild. All the other building crafts such as carpenters, slaters and masons were organised together in a separate and older guild. This cert was received by Bro Paul Cheevers - a plasterer after he qualified as an indentured apprentice. It would have been presented to him by the President and General Secretary at the time which would have allowed him to apply his craft in the city of Dublin. It is dated October 2nd 1821, over 190 years ago. The Cheevers family are still involved today, and his descendants such as James Cheevers (past President), Brian Cheevers, Alan Cheevers and John Swords are members. At the time the charter was granted Dublin was being transformed from the entrenched walled city, focused on the embattled castle, into a merchant capital city, expanding its street map and reaching out to its environs with open roads and new and more gracious buildings. One of the more prominent people within the union in the past 100 years has been Leo Crawford, President. 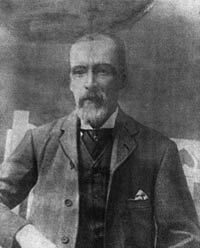 Bro Crawford was the President of the Union when the Union became the Operative Plasterers' & Allied Trades Society of Ireland. He was one of the most influential personalities within the trade union movement of his time. He was president of the Union from 1938 to 1969. He was also secretary of the CIU in 1946. He was also a joint secretary of the ICTUfrom 1959 to 1966 and was also president of the ITUC in 1943. When the English union the National Association of Operative Plasterers' left Ireland in the early fifties, the branches from around the country where left with no representation and the Dublin society and the country branches decided to form a national union as it is today. The Union became one entity in 1953 under a new rule book. On the 13th of December 1893 the Regular Stucco Plasterers' Trade Union of the city of Dublin registered under the Law with the Registrar of Friendly Societies. The union met in the Trade hall in Capel Street, Dublin, the premises of the Dublin Trades Council. Copyright © 2019 Opatsi: All rights reserved.